Prominent Edmonton physician James Frederick Brander (1879 – 1963) came to Edmonton from Nova Scotia in 1921 and, along with his father George, soon established a peony garden in the Bonnie Doon area on an empty plot of land that George couldn’t stand to see go to waste. 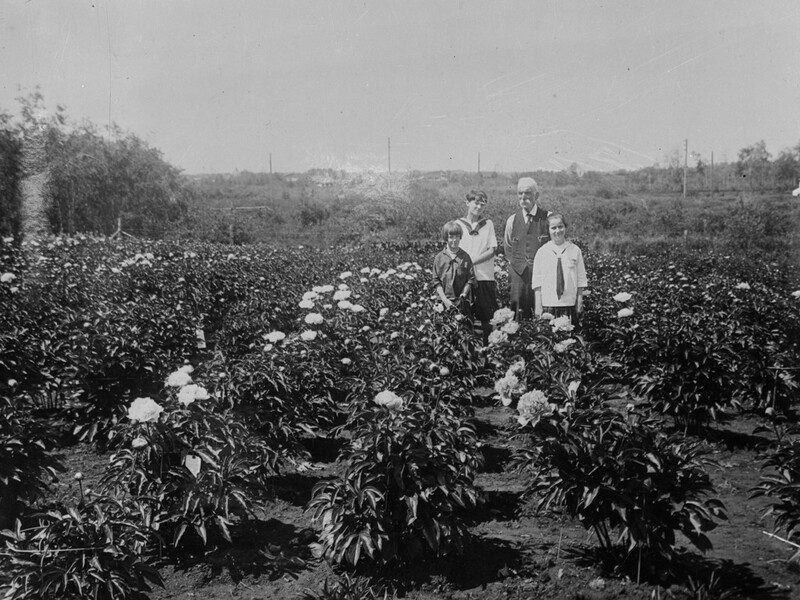 The Silver Heights Peony Garden, located at 93 Avenue and 85 Street in Bonnie Doon, was a major tourist attraction and the source of most of the peonies in Alberta from 1923 until the 1940s. Father and son proved that the soil and climate conditions in the area were ideal for the peony—which had previously been regarded as exotic and too delicate for the frigid north. Located south Edmonton, Brander Gardens elementary school is named after Dr. James Brander. Dawn received her Bachelor of Fine Art degree with a major in Painting (1998) and Ceramics (1999) from the Alberta College of Art and Design. in addition to curating group exhibits and actively exhibiting her own work, Dawn volunteered as a Gallery Co-ordinator at Untitled Art Society in Calgary for 5 years, and in 2007 made the move to Edmonton to be the Director of Programs and Marketing at The Works Art & Design Festival. She is currently developing 2 series of works "Alberta Farm Women” - a portrait exhibit honoring today’s Farm Women of Alberta, creating awareness around issues of farming, community and identity and "Surreal Series" - collaged paintings of circus performers, general oddities and sparkle paint.